Keep your safety program up-to-date with this 2015 Guide! 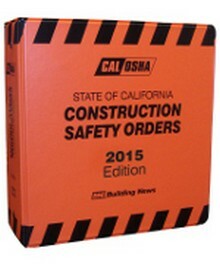 This complete updated edition of CAL/OSHA State of California Construction Safety Orders is the only version of Title 8, Chapter 4, of the Sub-Chapter 4 of the California Code of Regulations to accept regular Amendments via an optional amendment service that will keep your CAL/OSHA up-to-date. Now available in the popular 5 1/2” x 8 1/2” loose-leaf format, so easy to use and so handy in the field. With tables and graphics positioned within the text. The 2015 Edition also includes new and updated addresses and phone numbers for all headquarters, regional offices, district offices, and field offices, as well as all CAL/OSHA Consultation Services headquarters and field offices.